I’ve been thinking a lot recently about Thomas Jefferson. He has figured prominently the last couple of weeks in both of the courses that I am currently teaching, an upper-division class on U. S. history to 1865, and a general-education course on race and ethnicity as themes in the American past. I get excited when I teach about Jefferson, not only because he played such a crucial role in our national history, but also because he has loomed so large in American memory. My goal in all of my classes is to encourage life-long learning. I’m not concerned that my students memorize a bunch of discrete historical facts; I want them to get a glimpse of how engagement with the past can enrich their lives for all of their lives. This means, in part, helping them to see history as a living conversation, an ongoing dialogue with the past that occurs in the present with an eye to the future. Historian David Harlan has written that, “at its best, the study of American history can be a conversation with the past about what we should value and how we should live.” When Americans approach the past in this vein–when we study history to understand who we have been and to contemplate who we want to be–our nation’s third president inevitably becomes central to the conversation. As Jefferson biographer Joseph Ellis has observed, Thomas Jefferson is “the dead white male who matters most” to us. Why this is true is an open question, but I suspect that the paramount reason has to do with Jefferson’s principal role in crafting the Declaration of Independence. The Second Continental Congress edited considerably the draft that Jefferson constructed in 1776 (in consultation with delegates John Adams, Benjamin Franklin, Robert Livingston, and Roger Sherman). The wording was still predominantly his, however, and by the end of his life the wording had become exclusively his, at least in memory of the American people. 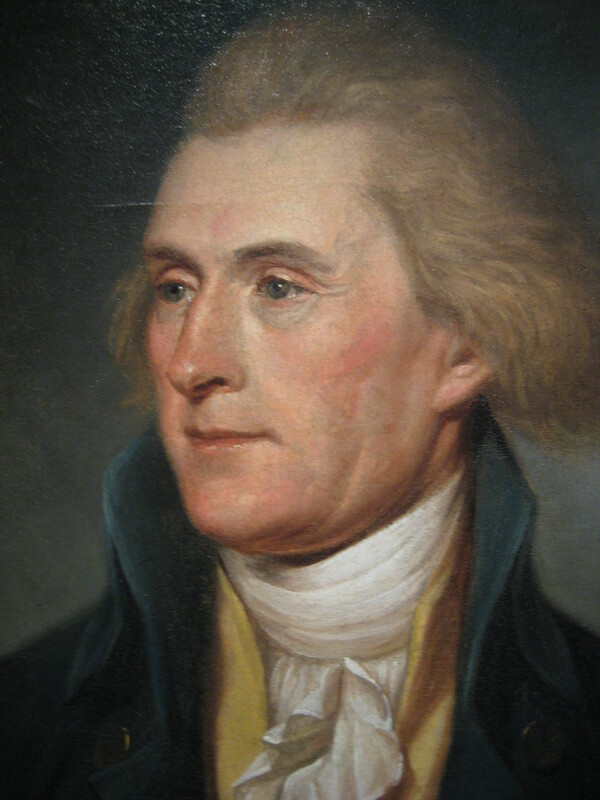 Thomas Jefferson sat for this portrait by Charles Willson Peale in 1791. This is especially true of the ongoing contest to define the extent of America’s Christian heritage, a struggle nicely encapsulated in the title of John Fea’s book, Was America Founded as a Christian Nation? Given Jefferson’s stature as the author of the nation’s founding charter, combined with his seminal early role in debates over the public place of religion in American life, it is understandable that Jefferson’s religious beliefs have become a battleground in the contest over this larger question. There is a cost to using history primarily as a weapon. Rather than facilitating our understanding, it actually gets in our way, making it harder–not easier–to see the past rightly. Complex answers don’t fare well in public debates, even when they’re true. One of my favorite observations on this point comes from the pen of Alexis de Tocqueville, the French visitor to the United States who related his observations in the classic Democracy in America. Tocqueville concluded, “A false but clear and precise idea always has more power in the world than one which is true but complex.” Tocqueville nailed it. Simple, appealing answers are always preferable when your goal is to win the battle for public opinion. Beyond distorting our vision, what I call the “history-as-ammunition” approach also commonly feeds our pride. Self-righteousness is often one of its first fruits. After triumphantly “discovering” what we had predetermined to find, we applaud our superior understanding, congratulate ourselves on our disinterested commitment to truth, and condemn our opponents for their blindness and bias. 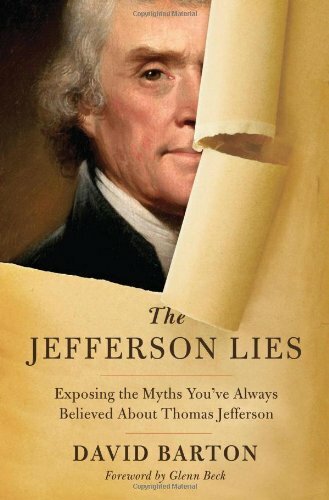 I read Nichols’ book over Christmas vacation, and his point finally convinced me to speak out about David Barton’s book, The Jefferson Lies: Exposing the Myths You’ve Always Believed about Thomas Jefferson (Thomas Nelson, 2012). I had long hesitated to write about Barton’s contentious “scholarship.” Numerous historians (several conservative Christian scholars among them) have already called attention to its numerous factual errors, half-truths, and misinterpretations, but it seems to me that Nichols’ point has somehow gotten lost in their critique of Barton’s historical claims. Note also that there is a “bait-and-switch” dimension to Barton’s promise to sweep away the “lies.” After explaining in the opening pages why academic scholarship cannot be trusted, when Barton actually shifts his attention in subsequent chapters to specific claims about Jefferson, the “lies” that he exposes often come from sources that few academic scholars would find credible, such as journalistic essays, personal web sites, and Facebook pages. (Can’t we all find someone on the internet who disagrees with us?) In some instances, at least, Barton is clearly toppling a straw man. Let me be clear: my goal is not primarily to defend the Academy against an outsider. Is some modern scholarship ideologically driven and hostile to traditional Christian values? Absolutely. But Barton’s approach is not preparing us to think Christianly or to argue persuasively about other perspectives. He is training us simply to attack the character of those who disagree with us. This is not a winsome witness to the world. It is more like schoolyard name-calling. Why is this a big deal? It is a big deal because an important part of what historical interpretations teach us has little to do with the past per se. Our historical interpretations always contain a “teaching behind the teaching,” to borrow a phrase from Christian writer Parker Palmer. Even when the “teaching behind the teaching” is not explicit, works of history are modeling to us a particular way of thinking about the past and of engaging with the present. Even apart from its contentious claims about Thomas Jefferson, I shudder to think that my brothers and sisters in the Church are learning from books like The Jefferson Lies about what it means to love God with our minds. Logically, this seventh “lie” involves two claims rather than one, and Barton should never have joined the two. If Jefferson was indeed an atheist, of course, it is necessarily the case that he was also not a Christian. The converse, however, is far from true, i.e., to establish that Jefferson was not an atheist in no way proves that he was a Christian. (The world is full of non-Christians who believe in God.) I can’t read Barton’s mind, but I find myself wondering whether he formulated this illogical proposition intentionally. Linking the two claims into one proposition helps to obscure the weakness of his argument about Jefferson’s supposed Christian faith. Jefferson was no atheist, and proving that he wasn’t is easy. (There is scarcely a single reputable scholar who argues that he was an atheist, by the way, a fact you wouldn’t learn by reading The Jefferson Lies.) The evidence that Jefferson was not an orthodox Christian, on the other hand, is irrefutable. I can imagine that you might be uncomfortable with my making such a dogmatic statement about Jefferson’s personal faith. Who am I, after all, to claim to have penetrated the man’s heart? But that is not what I am claiming at all. Yes, only God knows our hearts perfectly, so when someone claims to have made a profession of Christian faith, we are rightly hesitant to declare that God has not done a work in his or her heart, even if there seems to be much evidence to the contrary. But when someone comes to us and explicitly renounces the central pillars of historical Christian orthodoxy, it does not require divine insight to categorize that person as not a Christian, at least according to the historic creeds that have defined the boundaries of orthodoxy for centuries. Take, for example, the Apostles’ Creed, a distillation of Christian belief that took its final form in the seventh century. By my calculation, Jefferson explicitly repudiated at least two thirds of its indicative statements. Did Jefferson “believe in God, the Father almighty, Creator of heaven and earth”? Yes. Did he believe in “the resurrection of the body and the life everlasting”? Possibly. Did he believe that Jesus was God’s “only Son,” that he “was conceived of the Holy Spirit” and “born of the virgin Mary,” that he ” rose again from the dead,” that he “ascended to heaven and is seated at the right hand of God the Father almighty,” or that Jesus will come again “to judge the living and the dead?” The answers are no, no, no, no, and no. Measured by the Apostles’ Creed, Jefferson was a heretic, and we don’t need to plumb the depths of his heart to conclude this. To his credit, Barton concedes (in a masterpiece of understatement) that “in his later years” Jefferson’s views “do not comport with an orthodox understanding of what it means to be a Christian.” But he immediately goes on to insist–in the very same sentence–that “throughout his life Jefferson was pro-Christian and pro-Jesus in his beliefs.” Barton’s assertion that Jefferson only fell into heresy late in life is almost certainly wrong, but I am not going to take the time here to address it systematically. For our purposes, it is enough to examine how Barton characterizes Jefferson’s religious views in his old age. According to Barton, they were BOTH (1) outside the bounds of orthodox Christianity, AND (2) “pro-Christian and pro-Jesus.” How can both of these conclusions be true? They can both be true only if Barton is separating our perceptions of Jesus from the historic, orthodox understanding of Christ embodied in the creeds, which is precisely what enabled Jefferson to move toward heresy in the first place. After divorcing his understanding of Jesus from the historic creeds, Jefferson went on to jettison much of the Bible as well. Scripture was not the ultimate arbiter of truth by Jefferson’s reckoning; it was riddled with fabrications, embellishments, and the misunderstandings of human authors less enlightened than he. God had not left his creation without testimony, however. The creator had given to all mankind a moral sense by which to determine right from wrong, and he had also inculcated in humans the faculty of reason, by which they could distinguish between truth and superstition. “Fix reason firmly in her seat,” Jefferson counseled his teenaged nephew in 1787, and call to her tribunal every fact, every opinion.” In an appalling misreading of Jefferson’s counsel, Barton insists that Jefferson was merely trying to train his nephew to be a good apologist for Christianity, someone who would have a logically consistent and intellectually formidable defense of the faith (an 18th-century Josh McDowell, say). In reality, because Jefferson did not believe that the biblical canon is inspired, he explicitly encouraged his nephew to read the Bible in the same way that he read pagan literature, accepting whatever seemed to be in accord with reason and rejecting all else. “Your reason is the only oracle given you by heaven,” Jefferson stressed to his nephew. With amazing obtuseness, Barton quotes Jefferson’s counsel and underscores (literally italicizes) the phrase “given you by heaven.” It is evidence, he contends, that Jefferson “definitely held a strong, personal, pro-God position.” And yet the idea that reason was a faculty given to man by God was a common Enlightenment belief and hardly uniquely Christian. Far more revealing is Jefferson’s assertion that reason is our ONLY oracle. Indeed, in the very sentence that Barton cites as evidence of Jefferson’s “pro-God” views, Jefferson was actually denying the inspiration of scripture! Jefferson would have been gratified by Barton’s conclusion that he was “pro-Jesus.” In truth, Jefferson did have unbounded admiration for Jesus–as long as he himself could define who Jesus was, unconstrained by either Scripture or centuries of Church teaching. 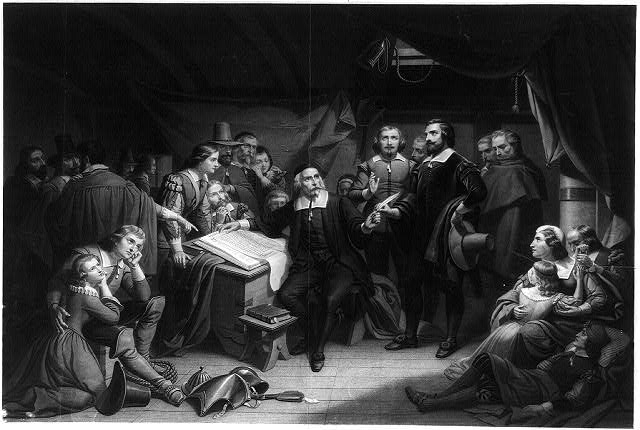 “I am a sect by myself, as far as I know,” Jefferson once confessed to a Prebyterian minister. Echoing Thomas Paine’s earlier declaration (“My mind is my own church,” Paine had written in The Age of Reason), Jefferson nicely foreshadowed the radical individualism, relativism, and insistent autonomy so pervasive in twenty-first -century America. By his own testimony, the Jesus that Jefferson admired was an enlightened philosopher, a moral teacher, and a “benevolent and sublime reformer.” The Jesus of Jefferson’s creation was appalled at the superstition of Judaism (“the depraved religion of his own country”). He sought to reform the Jews’ “moral doctrines to the standard of reason.” The God of the Jews was “vindictive, capricious, and unjust,” but Jesus had re-envisioned the Deity by imputing to him “the best qualities of the human head and heart.” In so doing, he had given the world a “Supreme Being . . . really worthy of their adoration.” God became truly worthy of our worship, in other words, once enlightened minds created God in their own image. And why does any of this matter, apart from a desire for historical accuracy? It matters because of what Stephen Nichols warned us about–in exaggerating Jefferson’s endorsement of Christianity, Barton is not only making claims about Jefferson. His findings reflect on Christianity, and what is more, they reflect on Christ. For all of its gross historical flaws, what bothers me most about The Jefferson Lies is how its author–himself a former pastor–minimizes the gravity of Jefferson’s heresy. In all candor, I am at a loss to know how to explain this. My best guess is that Barton has become so all-consumed with his campaign to prove that the Founders weren’t hostile to religion that nothing else matters. Determined to prove the point, Barton drowns out everything else that the past has to say to us, including much that American Christians need to hear. Today American Christians, including American evangelicals, are increasingly confused about the person of Jesus. A 2009 survey of self-described Christians by the Barna Group found that roughly two-fifths of American Christians believe that Jesus sinned when he lived on earth. An intensive 2010 study of Christian teenagers by Mike Nappa (The Jesus Survey: What Christian Teens Really Believe and Why) found that a clear majority doubted that the Bible was trustworthy, and fully one-third rejected the scriptural teaching that belief in Christ is essential for salvation. In part, such findings may reflect the impact of a wider culture that glorifies “tolerance” and rejects all exclusive truth claims as narrow-minded or bigoted. But as Kendra Creasy Dean observes in her book Almost Christian: What the Faith of Our Teenagers is Telling the American Church, it may also reflect the “watered-down gospel” that Christian teens are receiving from the church itself. Nappa agrees, concluding that such enormous misunderstandings of basic Christian truths “wouldn’t be widespread in our youth groups if adult Christians in our churches weren’t also embracing” them. David Barton apparently believes that the greatest need of the moment is to re-establish the cultural authority of the church in the public square. To further that end, he is determined to prove, at all costs, that one of our most eminent Founders wasn’t as opposed to religion as the Supreme Court seems to think. But it will be a hollow victory for Christians to increase their public presence if they have no more to say about Jesus than what Jefferson himself thought was true. Barton concludes The Jefferson Lies by characterizing our third president as a man sent by “Divine Providence” to “serve and inspire” us. We would do better to view him as a cautionary tale. Thomas Jefferson had many virtues, but with regard to life’s most important question–the question that Jesus asks each of us, “Who do you think that I am?”–Jefferson got it wrong. There is much that I could quibble with in the details of Kristof’s explanation. It is simplistic and one-sided, although I suppose that goes with the territory of a thousand-word op-ed. The one concrete recommendation that he offers—professors should “cast pearls through Twitter and Facebook”—is also disappointingly superficial. And yet the fundamental problem that Kristof points to is undeniable. In more cases than not, there is a chasm between academic scholars and the general public. This is true, furthermore, not only of scholars in highly technical fields, where the gulf is perhaps unavoidable. (Think Sheldon Cooper in The Big Bang—does anyone really expect a theoretical physicist to relate to normal people?) It is also true of professors in the humanities who have much to offer the general public and much less excuse for the isolation in which they labor. When I think about this problem, my heart and mind go directly to a particular subset of the larger pattern, namely the gulf that too often separates Christian scholars from their brothers and sisters in the church pews. As I have shared on numerous occasions, my heart’s desire is to find ways to bridge this gap. This is why I left the University of Washington for Wheaton College, why I want to write books like The First Thanksgiving, why I even started this blog. In this post and the next one, I want to think out loud with you about the possible causes of the chasm and what might be done to narrow it. I think Kristof is on to something when he suggests that the root of the problem lies both (a) in the culture of American society and (b) in the culture of the Academy. I’ll speak to the culture of the Academy first—I think I have more to add to this part of the conversation—and then next time I will share some thoughts and invite your input into how the church might be contributing to the marginalization of Christian scholarship. To begin with, let me emphasize that I think the Academy is full of Christian scholars who think of their vocations as a form of service to the church. Many of them work in small Christian colleges where they labor in obscurity, pouring out their lives in return for meager salaries and minimal professional reward. They are teachers first and foremost, and they serve the greater good by equipping generations of students to think faithfully about the life of the mind and the love of God. May their tribe increase. And yet the vast majority of Christians in the United States will never darken the door of a Christian college or university. To connect with the remainder, Christian professors cannot rely on their teaching alone, and therein lies the rub. Kristof is right when he says that academic culture discourages efforts to speak to a broad audience. Since the rise of the American university toward of the end of the nineteenth century, the Academy has effectively separated the purposes of teaching and scholarship. To teach is to convey knowledge only; to engage in scholarship is to push back the boundaries of knowledge. The former centers on simple communication, which supposedly anyone can master; the latter requires innovation, by comparison a rare and precious commodity. At the research university where I taught for more than two decades, the unstated assumption in faculty hiring discussions was that anyone who could write a “cutting-edge” doctoral dissertation would automatically be dynamic in the classroom. Generations of American college students might think differently. All this is to say that Christian professors who want to write for a popular Christian audience face a double whammy. To the degree that the result is palpably Christian, it will run afoul of an academic culture that equates traditional Christian beliefs with superstition and ignorance. To the degree that it is clearly intended for a non-academic audience, it will trigger the Academy’s contempt for anything “popular.” Serious scholars write for each other, after all. My point is not to absolve Christian professors of all responsibility. Allowing for many exceptions, on the whole we have accepted the values of the Academy too readily. We have passively allowed the academy to establish our vocational priorities, to determine which questions should be important to us, to define what should pass for excellence and success. We need to be bolder than we have been, less dependent on professional affirmation, and less reticent about declaring our ultimate loyalties. To do this we will need God’s strength, wisdom, courage, and grace. We will also need help from the body of Christ. That’s where you come in. Let’s talk again soon. WHAT WOULD THOMAS JEFFERSON THINK OF THE SUPER BOWL? Thomas Jefferson probably wouldn’t approve.